Other photos: Foredeck, Sidedeck - Starboard, Aft Deck, Stairs to Flybridge from Aft Deck, Flybridge, Aft Deck Doors, Salon, Salon, Salon, Dining Area, Galley, Galley, Galley, Stairs to Flybridge from Interior, Day Head, Pilothouse, Pilothouse Controls, Pilothouse, Stairs to Accommodations, Master Stateroom, Master Stateroom, Master Stateroom, Master Stateroom, Master Bath - His, Master Shower from His, Master Bath - Hers, Master Shower from Hers, Accommodations Companionway Facing Forward, Port Guest Stateroom, Port Guest Stateroom, Port Guest Bath, Port Guest Bath, Starboard Guest Stateroom, Starboard Guest Bath, VIP Stateroom - Forward, VIP Bath, Stairs from Accommodations, Stern, Tender, Engine Room, Engine Room, Engine Room, Engine Room, Engine Room, Running Gear, Running Gear. Hatteras superstructures are also hand laminated as one-piece sections to impart structural strength and seamless construction, with a high strength-to-weight ratio. The result is strong, lightweight parts with a smooth finish, imparting thermal and acoustic advantages. Graceful styling, lavish accommodations, and a good turn of speed characterize the Hatteras 80, one of the few US-built motor yacht in this size range designed to compete with European and Asian imports. Built on a low-deadrise, modified V-hull with prop pockets and a shallow keel, the broad 21-foot, 3-inch beam of the Hatteras 80 is the equal of most 90-footers. The accommodations aboard this magnificent yacht are as extravagant as they are spacious. Dominated by the vast salon with custom furnishings and a formal dining area, the layout includes four luxurious staterooms on the lower level including an absolutely magnificent full-beam master with a king-size bed and large vertical ports in the hullsides. The VIP stateroom and guest cabins are equally luxurious, and twin crew cabins aft are accessed directly from the afterdeck. Forward of the salon, the pilothouse features comfortable lounge seating, port and starboard deck doors, and a convenient day head. Additional features include a massive, state-of-the-art engineroom, extended swim platform, 1,500-pound davit, watermaker, and Naiad stabilizers. 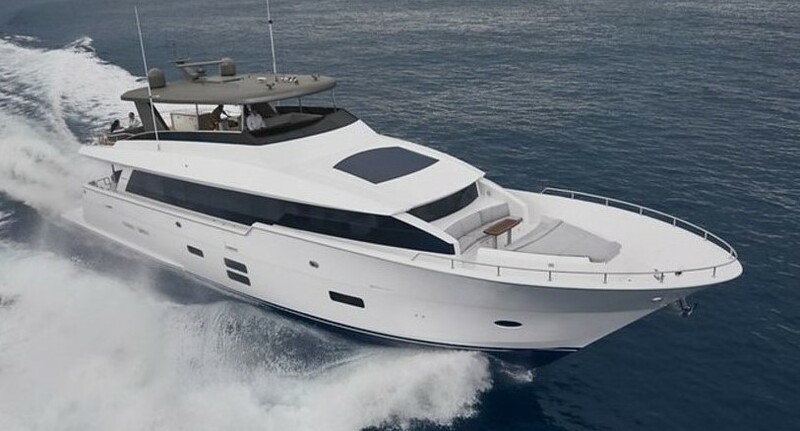 A seriously heavy yacht, 1,550hp Cats cruise the Hatteras 80 at 22 knots.